I find it hard to stay focused these days. There is so much demanding our time and attention. Emails, television, smart phones, Facebook and so much more. There is a great avoidance of silence in society, so much so that distraction is often a way of escapism from a reality we do not want to deal with. Distraction numbs us and dumbs us; it lulls us and dulls us. Immediately before this weeks gospel passage is the famous widows mite. Immediately before that, is the denunciation of the scribes. The comparison found in these two people – one from a group who seeks the attention, security and superiority, the other humble, vulnerable and forgotten – is picked up again in this gospel. The disciples become aware of the fine detail and stonework of the temple. But Jesus speaks of a time when these things will be laid to waist. The beauty gone: not one on another; all will be thrown down. Our focus should not be on the flashy and fabulous but on the humble and forgotten. 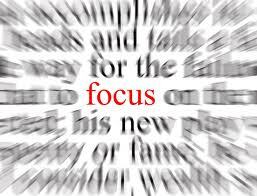 What grabs our attention is often not what we should be focused on. In asking again the wrong question (when and what signs?) the disciples reveal their understanding, or rather misunderstanding, of what is ahead. They are looking for the glory of the Davidic kingdom to be restored, a king of Israel to take the throne and rule the people. Talk about attention! But this is not to be. Not a stone of the temple will remain on another. “Beware you are not lead astray” Jesus warns, in hope that their focus remains on the Spirit and not on man. There is a great significance in the destruction of the temple. What demands our attention becomes a false temple that we worship. We are always checking our emails or Facebook or something at the neglect of real personal contact. Even today we have lost some focus on our lives: we have been lead astray. Our attention is in the modern, the shiny, the new and the trendy at the cost of the discarded, the outdated, the forgotten and the old. Jesus sees the proper value in these things and the inherent dignity of such people, and so should we. Jesus continues outlining what the future holds, and its not glory in the eyes of man. It is persecution, devastation, insurrection, earthquakes, famines, plagues and great signs from heaven. Among this shocking news Jesus reassures them “do not be frightened, for these things must take place.” But the end is NOT near, as some false prophets will tell you. Through these times of trial, there remains the opportunity to speak the good news to all. Focus on the Spirit and he will give you the words you need to speak. Focus on the Spirit, endure to the end, and we will gain our souls. Focus not on the things of this world but of the things of heaven, even when from it comes great signs. Endure all hardships proclaiming the good news of Jesus. Gain our souls by obediently trusting in what The Lord has done, and what the Spirit will do in us: giving an eloquence and a wisdom that is irresistible. Jesus starkly grabs the disciples attention. The warnings of the time to come are confronting. Do not focus on the details, the whens and whats, but on the Spirit who will lead us to everlasting life. Still today life is confronting. Great devastation, persecution, earthquakes and the like are still going on in innumerable places around the world: think of the Philippines and the Middle East to begin with. Yet Jesus says to proclaim the Kingdom of God to the end no matter what the circumstance. I need to stop being distracted and listen to the Spirit. I need to unplug my headphones and take a moment to stop and focus on Spirit, then proclaim the Kingdom of God through loving acts of service to the humble, the vulnerable and the forgotten in our society: those most affected by such turmoils. What demands your attention and takes your focus away from the Spirit of God? Are you lead astray? Can you tear down your temple with the help of the Spirit? What great turmoils in your life present opportunities to preach the gospel in loving actions?